Is sesame oil good for hair? The answer is yes. But that could be the answer if you asked the same question about avocado, olive, castor, rosemary, jojoba or peppermint oils – and just about all the other oils out there. My question is, "What’s special about sesame oil for hair?" What makes it different? What gives me a good reason to choose it above all the others? The answers that I found made me decide to add a good quality sesame oil to my shopping list. How to Find the Best Sesame Oil? Let’s start with why natural oils, including sesame oil, are generally good for your hair. Oils are classified as "conditioners", because they make hair smooth, manageable and shiny. They help to stop static in your hair - so stop frizzy hair. They also prevent tangling, as the cuticle (the overlapping scales on the surface of each hair shaft) is protected. Remember to add oil to damp hair before you start to comb it. Oils that penetrate the hair shaft help to make it "hydrophobic" – water resistant – and stop it from splitting. Generally, monounsaturated oils (like avocado oil) penetrate better than polyunsaturated oils (like flaxseed oil). Sesame oil has almost equal quantities of mono- and polyunsaturated oils, so some will stay on the surface and some with be absorbed – this makes it a good choice. Oils are particularly good for African hair, which tends to be very fragile and can be very dry because the tight curl prevents natural sebum getting to the ends of the hair. 1. For shine and softness, do a warm oil treatment once a week. Sesame seeds are called the "queen of oils seeds" because they are absolute powerhouses of nutrients: about half of the seed, by weight, is oil. It contains protein, iron, zinc, copper, Vitamin E, Vitamin B, calcium, magnesium and manganese. Then we add sesamin and sesamolin – these are unique lignans found only in sesame seeds – and sesamol, sesaminol and sesamolinol that are formed during the refining process. These add powerful antioxidant power. Sesame seeds are also anti-bacterial and anti-viral. Sesame oil is thought to be the oldest oil used by man and there are references to it over thousands of years. It is part of Hindu and Chinese culture and Indian Ayurvedic medicine. Sesame oil is still used for abhyanga, the daily Ayurvedic self-massage – especially for "Vata Dosha" mind-body types. 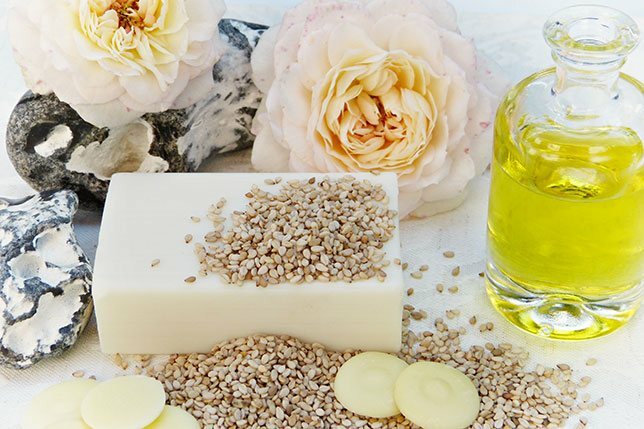 Today, sesame oil is added to massage oils, cosmetics, hair care products, soaps, perfumes and sunscreens. It moisturizes, soothes and softens. Sesame oil may be pricey, because harvesting it is such a labor-intensive activity. However, it is also a high-quality oil. It is one of the most stable edible oils, even to heat and light. It has a shelf life of about 4 – 6 months after opening, although this can be extended to 2 years in the fridge. The extraction method matters. 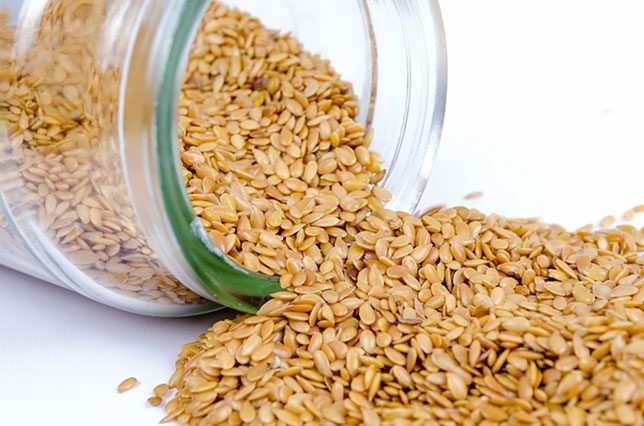 Research done by the Korean Food Institute showed that the lignan content – and therefore the antioxidant activity – of sesame seeds was almost non-existent after methanol extraction and even worse for hexane extraction. Cold pressing or expeller pressing are best. Depending on the cultivar, sesame seeds range from brown to black, and creamy white to beige after they are husked. Oil may be light golden colour. Darker oil is from seeds that have been roasted, and this oil has a much stronger flavor. It’s probably not a good idea to use sesame oil if you are pregnant or breastfeeding, because of its possible hormone-inducing effects. This is a big deal! Many people make claims about other oils, but, in most cases, it takes a bit of a stretch of the science! However, for sesame seeds and oil there is direct and specific research that shows how effective it is. 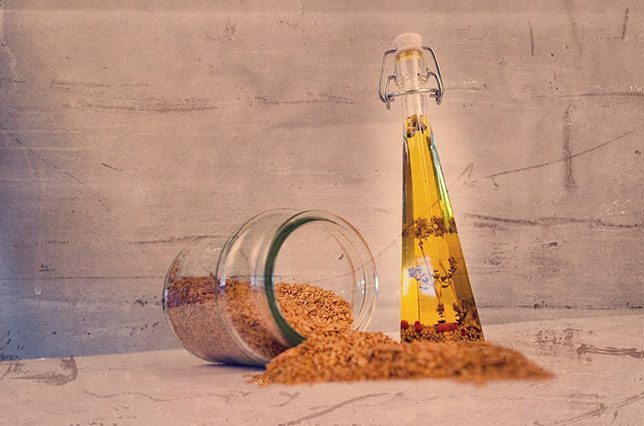 A study ﻿﻿und﻿﻿ertaken at Keimyung University, and published in the Journal of Biomedical Research, compared sesame oil to Mioxidil, which is the topical medication most prescribed to slow hair loss and stimulate hair regrowth. Black sesame oil was found to be just as effective as Mioxidil! There are 2 main forms of Vitamin E (tocopherols and tocotrienols), and each of them have 4 sub-types. 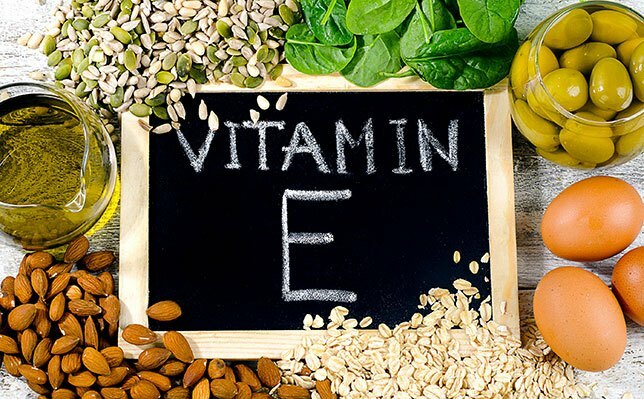 The tocotrienol form of Vitamin E has been shown to be particularly effective in dealing with oxidative stress that is one of the causes of alopecia (early baldness). The best source of tocotrienols is palm fruit oil, taken as a supplement. However – and this is the exciting part – when sesame seeds are added to the supplementation, they boost the effectiveness of the tocotrienols. As a result, the palm oil is even more effective – and that means less hair loss and less baldness. Research backs up this claim and links it to the very high anti-oxidant levels in sesame oil. This strong anti-oxidant power comes from the synergy between the lignans and the gamma-tocopherol form of Vitamin E found in sesame seeds. There are anecdotal accounts of sesame oil making gray hair dark again – and there is reference in Chinese herbal medicine to it taking 2 years to do this. However, I could not find any research findings about this claim. Nor could I find any proof that it would make blonde hair darker. Sesame oil molecules are recognised by your liver as "friendly" and are not removed from the blood. This makes it a great choice for scalp massages and as a treatment for dry hair and scalp. In fact, sesame oil is used as the base oil for many body massage oils all around the world, and is usually the base oil for Ayurveda medical oils. Massaging your scalp is the best way to use sesame oil and will give the best results. This property makes sesame oil particularly good for scalp treatments – to clean scalp, clear hair follicles and to deal with minor infections and dandruff. Studies show that it protects hair and scalp from up to 30% of UV rays. This can be compared to the 20% block out offered by coconut, peanut, olive, and cottonseed oils. This is important to protect hair from aging and from drying. Put sesame oil into a spray bottle and spritz over your hair if you’re going to be in the sun. Before I give you some ideas of how to use sesame oil for hair treatments, just a quick comment about hair porosity. Some hair has low porosity – this means that the overlapping scales of the cuticle are very tight and closed, and so don’t easily let moisture out or water (and treatment products) in. Some hair has high porosity, with the scales further apart or more open. Both can be healthy and in good condition, but need to be treated differently. If your hair is very porous, it is likely to absorb too much water when you shampoo or swim. Repeated swelling and then contracting of the cortex results in "hygral fatigue", loss of protein, and eventually breakage. Remember that the hair cortex may also have been forced open by treatments such as bleaching, perms or hair straighteners. You will need a deep penetrating oil treatment to make sure that enough oil is absorbed into the hair under the cortex to "waterproof" it. You might need to leave treatments on your hair for several hours or overnight. And, you will probably also need more oil per treatment than someone with low porosity. Low porosity hair can get dry from exposure to the elements and repeated shampooing. It will also benefit from oil treatments to improve hair flexibility and softness – but you may need to leave the oil on for a bit longer to make sure that some of it has been absorbed. It’s a good idea to add some heat – warm the oil or wrap your head in a hot towel. You probably won’t need a leave-in conditioner – and be careful that products don’t build-up on the outside of the hair shaft. You want to see whether your hair absorbs a lot of water or not. Pull a few hairs out of your head and drop them in a bowl of water. Using a pre-shampoo oil treatment is very helpful for all types of hair, and especially if it is tangled or frizzy. I like to use it because my hair lacks "weight" – so it floats or gets very wispy after a shampoo. Pour 1 to 3 drops in your palm. Dip your fingertips into the oil. Rub gently over the ends of your hair with your fingertips. Dip your fingertips into the oil again, and stroke it over the hair a bit further up from the ends. Finally, rub your palms together with the little bit of remaining oil, and smooth it over the surface of your hair. Leave for at least 30 minutes, them shampoo your hair as usual. Don’t over-shampoo to get all the oil out – a little left in is what you want. 1. For very porous hair, use up to a teaspoon of oil, rather than a few drops. Leave it for several hours to soak in. Grate and then juice the ginger. Mix 1 to 2 tablespoons of the ginger juice with the sesame oil and lemon juice. This is enough mixture for several treatments. Keep it in the refrigerator between uses. Leave it on for 15 – 30 minutes, then rinse off. Repeat at least 3 three times a week. Why ginger? Ginger is an antiseptic and anti-inflammatory, so helps to keep the scalp clean and stops dry, itchy skin. It also contains the antioxidant gingerol. It stimulates warmth in the scalp and increases blood circulation. Why lemon? Lemon is an antifungal, so helps to keep the scalp healthy. It also helps to unclog hair follicles, and the acidity tightens the follicles. All of this stops hair fall. You can also add a few drops of rosemary oil (to stimulate blood flow) or peppermint oil (to promote hair growth). Aloe vera removes sebum and dead cell buildup on the scalp and unclogs the pores – you can add 3 tablespoons to the sesame and ginger mix. Give your scalp a good massage every night, even without the oil mix. This will improve blood circulation, prevent baldness and i﻿ncre﻿ase hair thickness. I hope that you enjoyed finding out about sesame oil for hair – and that you’ll try it. I was especially pleased to see that taking sesame oil as a supplement was good for hair. This means that if I buy a good quality oil (pure, unrefined, virgin, cold-pressed), I can have smooth, shiny and healthy hair by rubbing some of it into my hair, and pouring the rest over my salad! This content is very educating! Thank you very much. I would like to use the Sesame Oil on low porosity hair. I don’t understand clearly if this is a good choice or not. Can you elaborate please. Thank you.